"My second favorite household chore is ironing. My first being hitting my head on the top bunk bed until I faint." Before we begin, I have a small confession to make. Ironing, sadly and truthfully, is the least of my favorite homemaking loves. In fact, every time I read the words (shared above) by the late Ms. Bombeck, I am in tears (the humorous kind)! Here is a compilation of ideas, old fashioned homemaking tips, diy's and encouragement that may help to inspire you (and I) to love those linens and iron! I think in a very few minutes, your mind may be transformed to see the beauty in this little task! "Ironing gratifies the senses. The transformation of wrinkled, shapeless cloth into the smooth and gleaming folds of a familiar garment pleases the eye. The good scent of ironing is the most comfortable smell in the world. And the fingertips enjoy the changes in the fabrics from cold to warm, wet to dry, and rough to silky. There is nothing like keeping the hands busy with some familiar work to free the mind. You can learn Italian while you iron, as a friend of mine did, or you can simply think." To begin, it helps to have a peaceful and clean environment to iron in. That is often difficult to do because the ironing board is usually the household item that gets stowed away and hidden. If you have a large laundry room, that would be ideal. Decorating with old fashioned signs can also make it more enjoyable (you will find our printable set here). 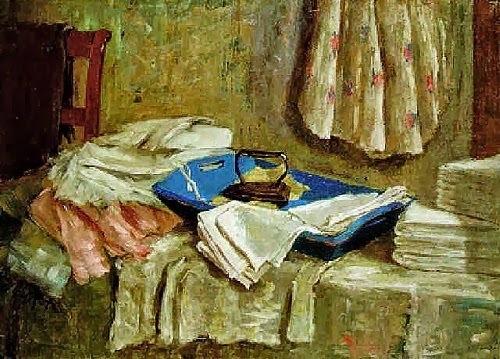 Our ironing board is kept in our back room and before ironing, I make sure the area is clear and clutter-free to make it a pleasant homemaking experience (such as the one described below). 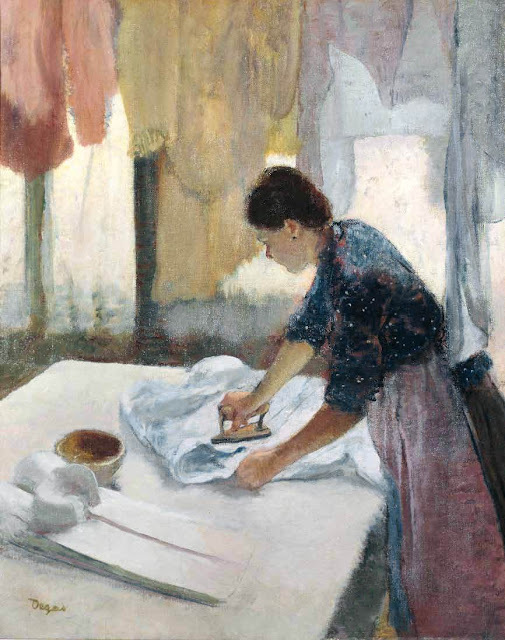 It is interesting to note that the artist Degas (who was famous for his impressionistic ballerina paintings), also took the time to capture women doing the daily duties of washing and ironing. Perhaps he saw the beauty in the ordinary homemaking arts! 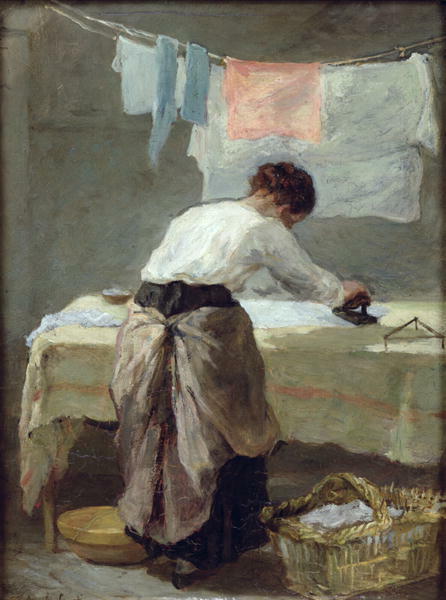 His work is depicted in all the paintings featured above this paragraph (except for the painting showcasing the "Gentle Homemaking Inspiration"). Wipe the soleplate with a sudsy cloth or nylon-mesh pad (make sure your iron is unplugged and cool). If starchy buildup or corrosion is present, remove either with a cloth saturated in white vinegar or make a solution by heating equal parts of vinegar and salt (until it is dissolved). Do not use abrasive cleaners or metal scouring pads. If mineral deposits are coming through the holes of the soleplate, the reservoir needs a routine cleaning. To do so, fill the reservoir approximately one-quarter of the way up with white vinegar. 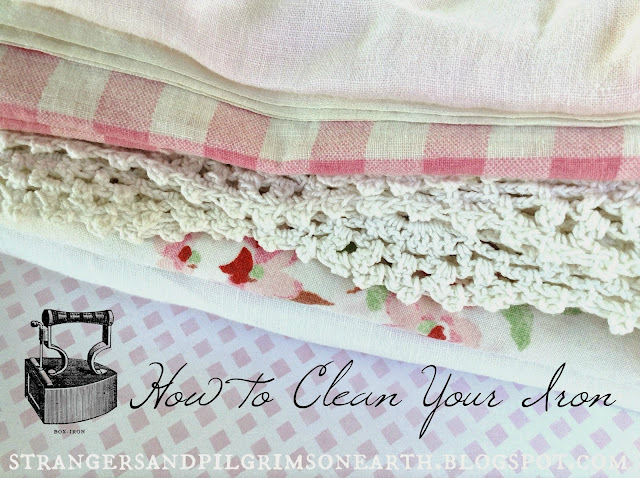 Turn on the iron and steam-iron a clean rag or towel until the reservoir is empty. The fumes may be strong so keep a window open and a fan going if necessary. If problem persists, refill the reservoir with water and continue to steam iron the rag until empty once again. Do a final rinse on the reservoir by filling it with (distilled or purified) water and then emptying it out. To prevent future buildup in your iron, use only distilled water. Each time you use your iron, empty water from the reservoir while it is still hot so that it will dry out. This can be achieved by slowly and carefully tilting the pointed end of the iron down over a sink. For best results, always store your iron in an upright position. A few do-it yourself ironing recipes can be made to create a sense of purpose in your ironing area. One of my personal favorites is this DIY Lavender Water. It makes for a lovely and aromatic ironing spray. 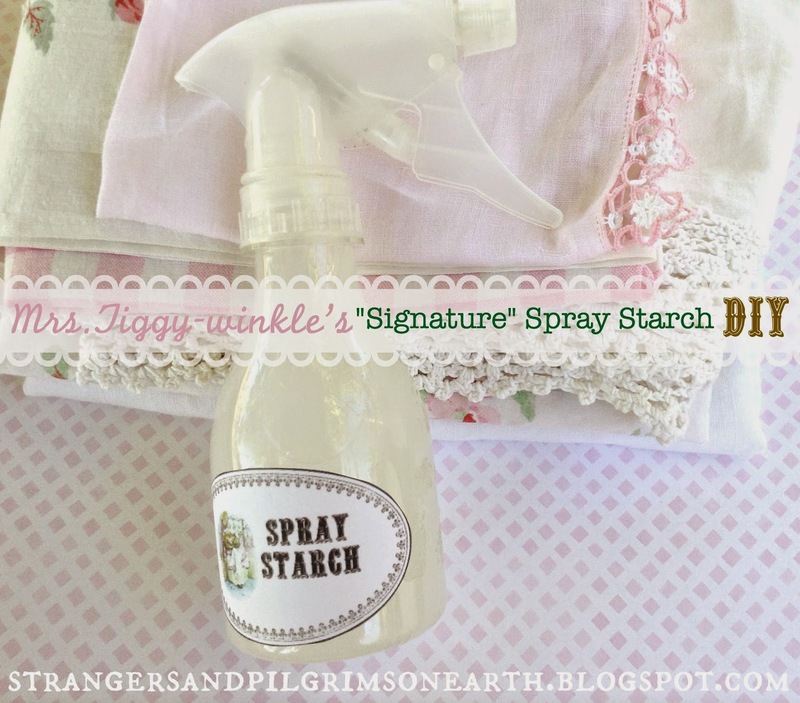 There is also an old fashioned spray starch recipe that can be made in minutes! Store these handcrafted goods in recycled glass bottles with attractive labels in order to foster a sense of delight in this homemaking task. "You may also like to utilize the essential oils when ironing. You can either put 1 drop of essential oil in a plant mister and spray the clothes before ironing, or put a drop on a damp linen cloth and place that between the iron and the material. You could also put the essential oils directly into the water compartment of your steam iron, but essential oils are not water soluble and could leave a residue in the iron." Is Ironing Still Relevant Today? 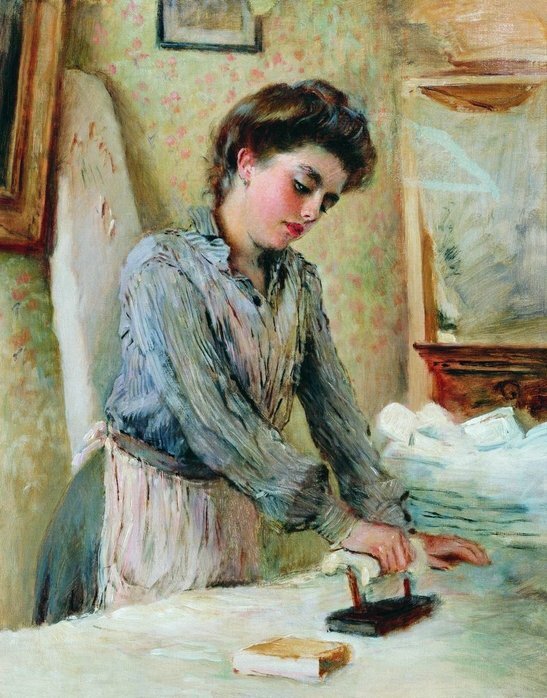 Perhaps you are thinking that the modern-day denim and knit clothing you own does not require such ironing and care. However, the clothes we wear to our Sabbath gathering should be considered. Are we dressing appropriately for the "House of God"? Do you remember the term "Sunday best"? Dressing up and ironing your clothing for worship shows its importance and seriousness. It shows something that our modern-day culture often neglects, it is called "reverence". Dear Moses met with the Creator in the dessert via a burning bush and learned this lesson. Our formal meetings in the church with the Almighty should be just as important. for the place on which you are standing is holy ground." For our God is a consuming fire." "I find it soothing to take something wrinkled and make it smooth. It feels anticipatory. It's what I do before a celebration." And life, my dear homemaker, is a celebration! 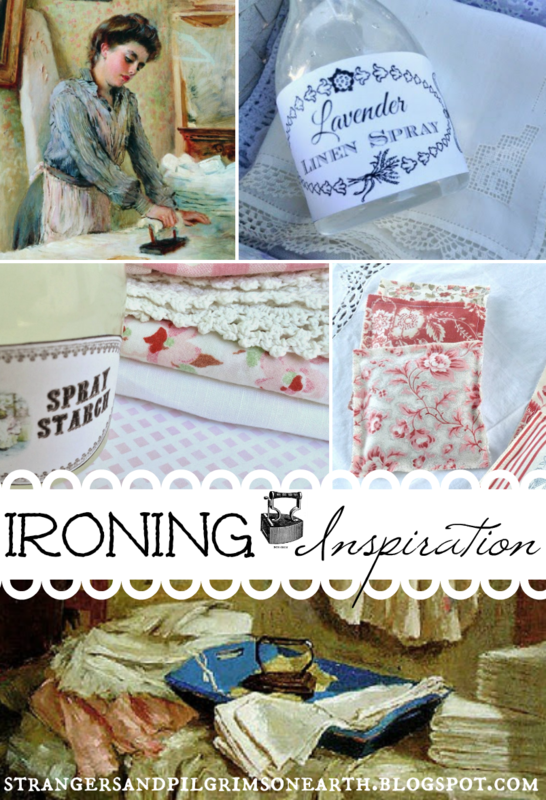 I love the *idea* of ironing....and actually enjoy ironing things that are easy...such as cloth napkins and such. Dress shirts with sleeves and buttons drive me crazy....I iron and iron and still end up with wrinkles somehow! Haha! Here! Here! I am right there with you! Ironing square and rectangle items is fun but once you get to collars and sleeves... Oh dear-- it isn't so pretty! I find if I iron in the right order it helps. Back placket, right arm, collar, left arm, right front, back, left front. The sleeves and collar stay pressed better than the body of the shirt. However, there are some shirts that I would rather just put in the rubbish! Dearest Jes, what a delightful post and one that greatly encouraged me as I, too, do not favor ironing. 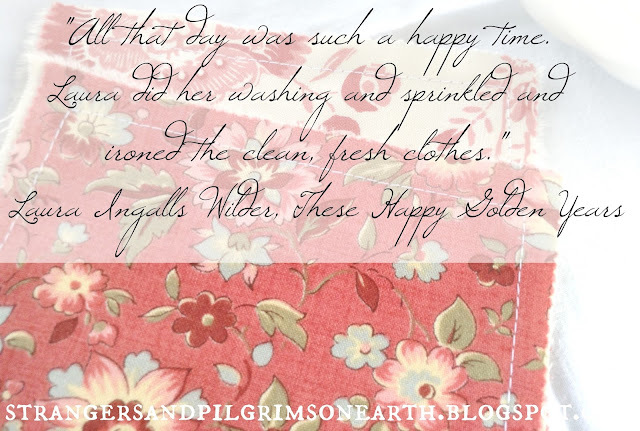 I had to giggle at the quote from dear Erma :) Just this last Saturday I got all my ironing done - I tend to iron only once every 4 weeks since we can get by for that long. When I am ironing I often get lost in thought and tend to talk to the Lord which is certainly a blessing. And truly, it's a joy to serve my family this way. Thank you friend for the sweet reminder. This post was a blessing. Hugs to you! Glad you got a giggle from the Erma quote too! It just makes me laugh each time! I like the idea of doing a month worth of ironing at once. You can set up shop, put on some inspirational music, make up some batches of sprays and enjoy the moment :) Thanks for sharing! I find that if I listen to music, a documentary, an old movie, or a sermon it helps. Thank you for this beautiful and encouraging post. I actually enjoy ironing, but I think it is because we live in a permanent press world. 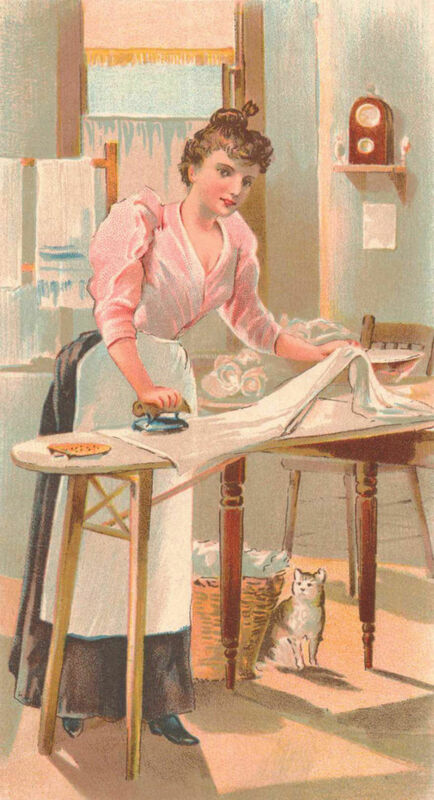 We don't have to iron everything the way our mothers and grandmothers did. One of my favorite weekly activities is laundering and ironing our bed sheets and pillowcases. I do use a little homemade lavender spray when I do the final press of everything. I too must turn this task into a choice for joy and serving my husband, or when I'm at my children's houses, I also iron for them. My grandmother did that for me when she visited and she could make a linen blouse look spectacular, no starch. We're empty-nesters and I prefer to iron DH's tomorrow-clothes each morning or the night before. "Dress how you want to be addressed." I want his crisp, put together well-ness to make a statement to others: "His wife really loves him." Years ago when I worked at Dillard's in the Men's Dress Shirts/Ties department, the self professed "old maid" Miss Catherine Kruessel, then in her mid-60s, taught me to never let my husband out the door in wrinkled clothing. She was an aged, Titus 2 woman for sure. I loved every teaching moment she seized and will never forget her wise words for, hopefully, as long as I live. One thing I do is dress up my ironing board. With cheery fabric that coordinates with my office/Inspiration Station, I make a new, washable cover for it about every two or three years. Sometimes I'll use sheets, or fabric from my stash or treat myself to new fabric "just because." 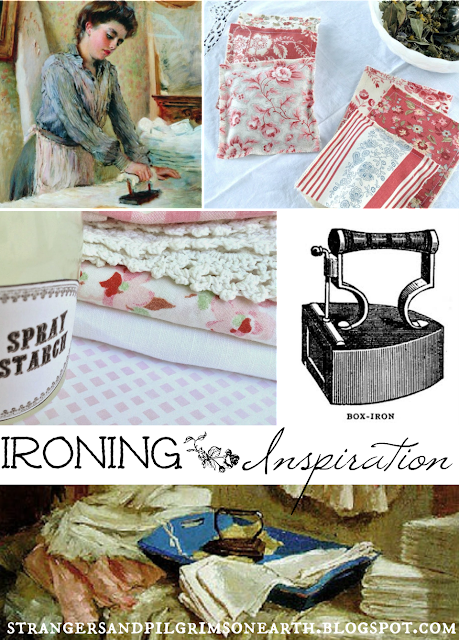 It's just too pretty not to be boring, ironing, when the board is wearing such a darling outfit! Thank you for sharing Mrs. Dibble! Your comment was delightful! And I agree, a properly dressed ironing board cover does wonders! I can't believe I didn't include that in the article! Perhaps I will update in the future. Have a lovely week! I do love such animated comments, don't you Jes? Those are what makes blogging fun! Thanks for hosting such a great linkup! So many ideas for getting focused on our most important responsibilities ... our home! Oh, loving the Erma quote. 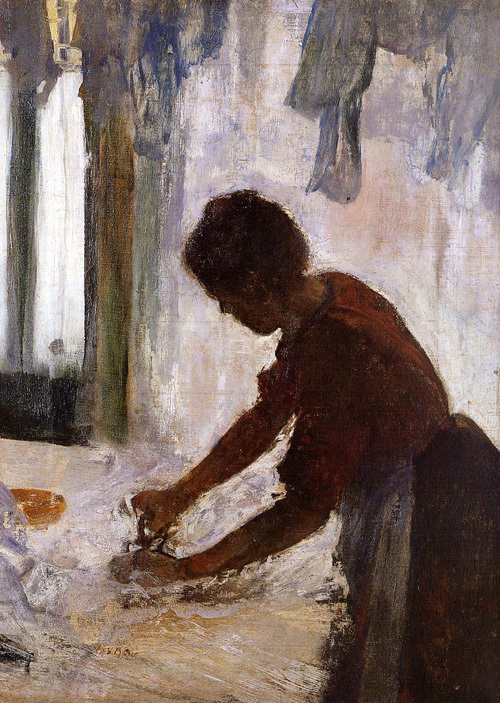 Also, Degas is one of my favorites:) This is a wonderful post. Hubby is a metal fabricator and actually burns holes in his clothes on a semi-regular basis. His work shirts are unmistakably "work shirts." I iron them as well as our regular items. He says I don't have to and I tell him that I do. Even though his clothes are going to be destroyed by his work, when he arrives in the morning, folks will know he is clean and pressed. . .that he cares. Somehow, I don't mind ironing quilt squares, but pleats and buttons are a different story. I love iroing, Jes. I find it wonderfully relaxing and strangely fulfilling. Yet mopping floors? Oh my, that's my Achilles heel. Do you have some wonderful ideas for elevating this chore in my heart? Hope you are feeling better Jenny! I finished ironing all of my dresses and my husband's dress clothes earlier this week. I don't usually do it all in one day, but I was listening to a history lecture by David Barton and seized the day! Great idea about listening to a lecture or audio book. That always helps the time fly! Have to admit, love to iron, have been ironing since was about 8 yrs.old. Had to iron my Dad's underwear, weird style was hard to get wrinkles out. Ironed his hankies and pillow cases also, now this was in 1948. A lovely post for a sometimes NOT such a lovely task! Thank you for the beauty you have found in ironing! Please tell me what I am looking at...the beautiful rose-fabric squares are so lovely (especially the ones with the blue flowers) but I am not sure what they are! Dear JES...oh! What beautiful, beautiful encouragement to embrace the simple home duties the Lord has blessed us with... I too have never been a great lover of ironing clothes but lately I have discovered it can actually be quite theraputic and ah... I love the sight of a pile of freshly pressed clothing to be put away... Sometimes I will watch a lovely period movie such as Wives and Daughters to remind me of how wonderful it is to be a lady and to be responsible for all the simple home duties... Thank you for your sweet inspiration ~ I loved how you compiled beautiful quotes, paintings and ideas for this task! Many blessings and much love to you! I have found you from The Modest Mom link up. Your posts are so beautiful. 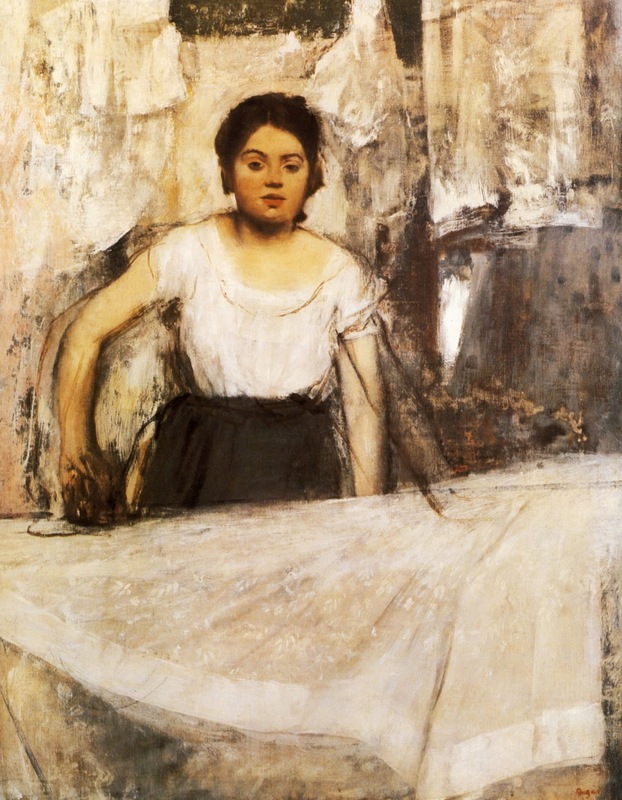 I think you have captured the drudgery of ironing in such a beautiful way. It truly is an inspiration. Recently found this and had a comment a year later. I LOVE IRONING, there I said it. I realize most people don't but I find ironing calming and very fulfilling, to see a pile of clean laundry all ironed hung or folded makes me feel like I did something. Also a few years in a row I use to help out the dry cleaner just around the corner where we lived, I would do it from 12pm to 3pm while the children were in school. I could iron a man's dress shirt in 9 minutes, I wonder if the record still stands.hee hee.